In the first year of your lawn care experience, the aim is to reduce the amount of moss and thatch in the lawns, but don’t expect miracles, as these things take time. Also, you can’t expect to fix what is often many years of neglect with a single pass of the scarifier. The first year is more about, clearing the weeds, making sure the grass is fed properly and that what moss is there is killed as best we can, and preparing the upper soil level (root level) for the winter and following spring. You may need your lawn to be renovated. If you feel there is still a lot of moss and thatch left behind in the early stages of your lawn care program. 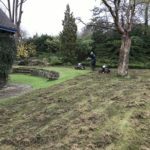 Perhaps you should have opted for a renovation, this may involve, multiple passes with our professional scarifiers, followed by re-seeding, and not just a light over seed. This will be followed up with a watering program advised by our team and a special fertilizer aimed and fast root growth and development. Please ask one of our team if you would like to know more. The second year will build upon what was achieved in year one, by further reducing the thatch and moss levels (aiming for an acceptable percentage is more realistic than expecting some sense of perfection, as this is unrealistic to be honest) and making sure any new weeds are treated, along with getting the feed balance correct for the grass to best utilize it. Mid way through the second year is where you will start to really see the lawns perking up. Please remember that without good mowing practice and occasionally watering, the hard work that we do may be in vain. Close cut domestic lawns will never be that healthy, as the type of grass that is typically used on your lawns is not designed for close mowing (like on a putting green for example) all that you are doing when cutting short, is stressing the lawn and reversing much of the hard work that we carry out. Aim for 4cm at the lowest and raise the height in accordance to the weather and soil conditions. Better to aim for a 5cm cut in the first year, to help with the recovery of the lawns. By the third year, your lawns should be more or less moss, thatch and weed free by the summer months, but during the down time, don’t expect the lawns to look amazing. The lawns need to rest too, just like we do. Remember to leave the lawns longer for the winter months. (This helps them to protect them selves against moss and weeds blowing in, and to utilize what sunlight is available for root growth whilst you are not mowing it). Regular mowing with a sharp blade and watering when needed is all you will need to do. Please note that moss, thatch, compaction and weeds are a constant enemy, and these are the reasons that annual lawn care is required in the first place, so please don’t despair as we will be along to help sort these issues out each year, step by step. For any more advice on your lawns needs and health please contact us, as we are always happy to help you to help us.